Gay New Jersey waitress Dayna Morales, a server at Gallop Asian Bistro in Bridgewater, N.J., claimed a family she waited on stiffed her, insulted her and left her a nasty note about her sexuality. She told the liberal media the family denied her a tip and wrote her a hateful note on their receipt. However, on Thursday a local family contacted NBC 4 New York and said their receipt shows they paid a tip and didn’t write any such note. 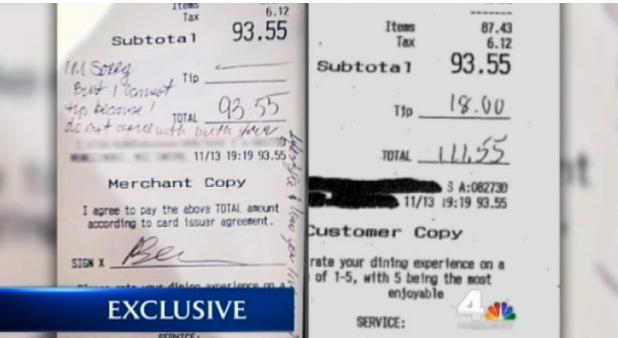 The couple even produced a copy of the receipt that shows they tipped the waitress. Dayna Morales received thousands of dollars in donations after the story hit the internet. On Saturday Dayna Morales was fired. A New Jersey waitress who raked in thousands in donations after claiming a couple didn’t tip her because she’s gay was fired from her job on Saturday. Dayna Morales, 22, was finally canned from Gallop Asian Bistro in Bridgewater — nearly a month after she made national headlines over what’s likely a hoax. The restaurant announced her termination on Facebook Saturday shortly after it was revealed she was returning donations from supporters across the world. But her tale of prejudice began to unravel after the unnamed diners came forward with receipts showing an $18 tip. The purported incident created a media firestorm, with well-wishers sending Morales at least $3,000 in donations through a PayPal account. Morales claimed she’d send proceeds to the Wounded Warrior Project, but the group said it hasn’t received anything.